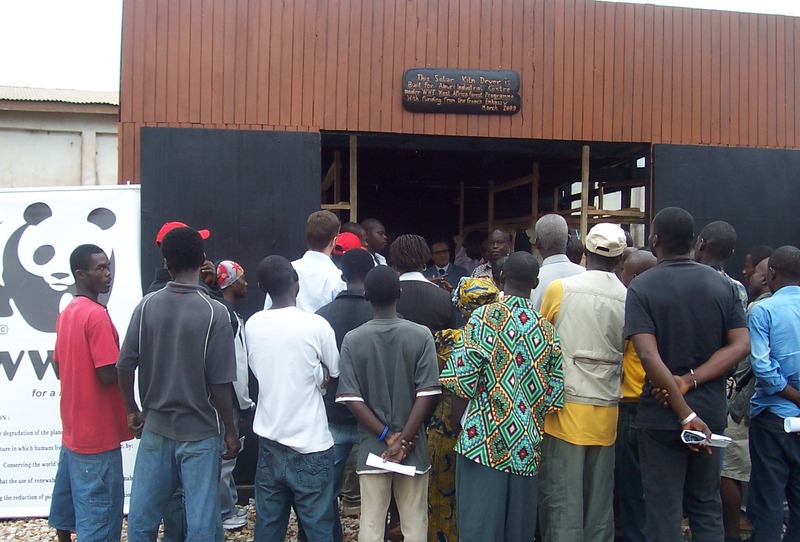 Hope has been restored to the wood carving industry in Ghana with the installation of a 10,000-dollar Solar Kiln Dryer for wood carvers at the Aburi Industrial Centre (AIC) in the Akuapem South Municipality of the Eastern Region. "The solar kiln dryer will facilitate the drying activities of wood carvers at the AIC and particularly enhance the use of neem (Azadirachta indica) as an alternative wood species for carving," according to the Accra-based West Africa Regional Programme Office (WAFPO) of the World Wide Fund for Nature (WWF). The WWF- WAFPO provided the facility, measuring 25m3, to cap an 18-month pilot project on "Alternative Carving Wood for Sustainable Livelihood in Ghana." The French Embassy in Ghana financed the entire project to the tune of 48,000 Euros (about 70,000 Ghana Cedis). At the commissioning of the project on Thursday, Dr. Kwame Asamoah Adam, WWF- WAFPO Forest Programme Leader, said the facility could also be used to enhance the practical training of Junior High School students who wish to be trained as artisans and Senior High School students who may use the facility as a source of reference who wish to be artisans as well as those in the sciences. He indicated the desire of WWF-WAFPO to replicate the project in other wood carving communities across the country such as Ahwia, Ofoase and Kpando. He, therefore, encouraged other donors to come on board. The WWF-WAFPO started "Alternative Carving Wood for Sustainable Livelihood in Ghana" following the realization that most sought after traditional tree species like Ossese, Ebony, Danta and Kusia, which served as raw materials for wood carvers had become rare and locally extinct because they were virtually depleted in Ghana's natural forests. This threatened the well-being of wood carvers who depended on the supply of these species for their livelihoods. Naturally, the AIC, the largest of four wood carving centres in Ghana with an estimated 1,300 of the nation's 3,500 carvers was severely affected. The scarcity of raw materials also had consequences for Ghana's export of handicraft. In 2004, handicraft exports were in excess of $2.3 million. This shot up significantly to $18.9 million the following year though Ghanaian carvings struggled to compete in quality with those from Eastern Africa, notably Kenya. There was need to replenish the forests or find alternatives. The WWF-WAFPO project aimed at identifying and developing suitable and sustainable alternative carving wood sources by facilitating a shift from the use of the fast diminishing but preferred species to suitable fast growing species such as the neem tree. Several targets were set for the project including sensitization of stakeholders in the carving industry about the neem as an efficient alternative wood source and subsequent adoption of farm forestry for neem trees by land owners.Dr. Adam pointed out that the kiln was not part of the initial project design but its establishment became fundamental to the successful realization of the project's objective of introducing neem tree as an alternative carving wood to carvers at the AIC. Mainly, it would provide solution to the problem of improper drying mechanism of the neem wood in the open air and help carvers to meet large orders on time. The neem tree grows extensively around Accra plains and has the advantage of being widely available and fast growing compared to the indigenous hardwoods. It however has two major problems. The first has to do with cracking and checking of neem wood during various stages of carving and in the finished product. The other is the growth of mould on finished products. Experts say both problems are moisture related; the cracking and checking are generally associated with rapid drying while the moulding has to do with insufficient drying to below a certain level of moisture content. A representative of the carvers said the project had been very beneficial to them, especially because it had enhanced their capacities.Mr. Arnaud Dornon, Head of the Cooperation and Cultural Service of the French Embassy, said the agency supported the project through its special programme for non-governmental and civil society organisations called the Fund for Social Development (FSD). "The French Co-operation strongly believes in linking economic development and protection of the environment," Mr. Dornon stated, expressing optimism that "the whole project will enable the carvers to increase their income and provide them with a better livelihood."